I make a website for a recording studio that provides about 15 services. Each service can be "customized" with options (depending about the quantity of days, the work to do...). For the moment, I made a kind of list with details on click on an element. I am wondering what is the best way to make this quickly clear without being too "commercial". I think you're already well on your way. 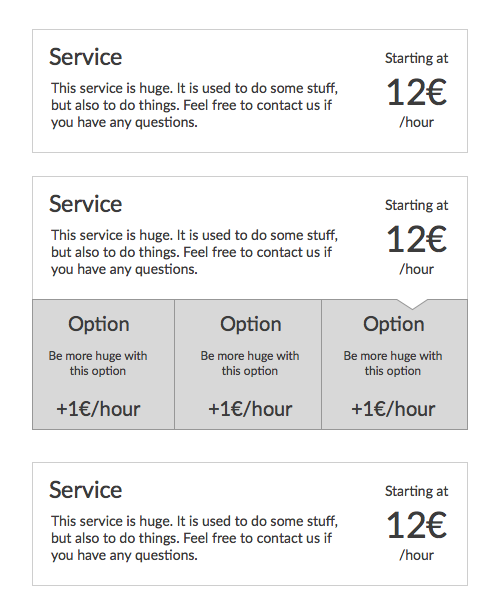 15 services + options is a lot and I think your mockup is already pretty clear. It's hard to circumvent the issue that it will be quite a list. To add on this concept I would advice some sort of counter that keeps track of the price /hour with every option selected. With the starting amount of €12/hour and two options +€1/hour each, the counter would say €14/hour. I don't know if this is at all possible, but you could turn it all the way around and instead of providing solutions for the visitor to decide which fits best with their problem, you could let the visitor select their problem and provide them with the fitting solution. Perhaps there are fewer problems then there are solutions (services). Problem/need: "I need a radio commercial"
Not the answer you're looking for? Browse other questions tagged pricing or ask your own question. Where should you place pricing information so it is seen? Why are pricing conventions so different in the US opposed to other countries? “change subscription”, “manage subscription”, “pricing” how to name the button that leads to the pricing page? How is product pricing affected by heatmapping? Pricing Plans, Why always 3 options?